Your body produces earwax naturally and it plays a big role in cleaning, protecting, and lubricating your ears. In some cases, the wax starts accumulating excessively and demands manual removal. The problem is that sometimes people end up hurting their ability to hear during ear wax removal. The ear, including the eardrum and the skin of the ear, is quite delicate, so you should think twice before using cotton-tipped applicators or something similar to get rid of the ear wax. Why Should Ear Wax Be Removed? Ear wax, also called cerumen, is a shiny, gooey substance produced by the wax glands in your ear canal. The basic purpose of ear wax is to coat the ear canal and keep it moisturized. It also contains antimicrobial properties and helps fight off infection by keeping dirt, dust and other debris from getting deep inside your ear. Ideally, you don't have to do anything to get rid of ear wax because the ear canals are self-cleaning and throw ear wax and dead skin cells out of your ear in slow yet consistent manner. The issue is that sometimes too much ear wax accumulates in the ear, close to the eardrum, which leads to several problems. Many people try to use bobby pins, cotton-topped applicators or twisted napkin corners to remove excessive ear wax, but they only make matters worse by pushing it further towards the eardrum. 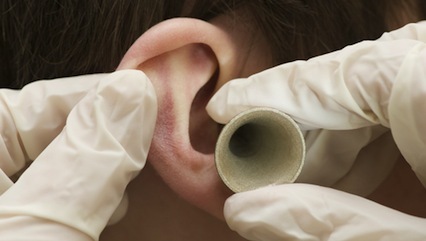 If you don't take steps to get rid of that excessive ear wax, you may notice several issues. Some of the most common problems include partial hearing loss, earache, tinnitus, odor, itching, fullness in the ear, and coughing. Only a qualified physician should take a closer look and decide the proper way for excessive ear wax removal to relieve all these symptoms. You can try different ways to eliminate the excessive ear wax buildup. A number of home remedies are available to unblock and chuck out the hardened ear wax. Use saline solution: Prepare a mixture of ½ cup of warm water and 1 teaspoon of salt. Then dip a cotton ball in the solution and gently squeeze it to pour a few drops into the ear. Keep your head tilted upward for a few minutes. Finally, tilt your head in the opposite direction to drain out the solution. Try hydrogen peroxide: Prepare a solution of water and liquid hydrogen peroxide. A few drops of this solution into the ear may work wonders and help you remove ear wax without a hassle. Just make sure you're not using the hydrogen peroxide above 3%, or it may have detrimental effects. Use glycerin/baby oil: A few drops of mineral oil or baby oil will help soften the ear wax. You can place a cotton ball in the ear to ensure the oil doesn't spill out. Vinegar and rubbing alcohol solution: Get a mug or a small bowl to prepare a solution containing rubbing alcohol and white vinegar. Pour a few drop of this solution into the ear. It is extremely effective to loosen the hardened ear wax which makes it a lot easier for ear wax removal. Olive oil: Using olive oil during bedtime will help soften the ear wax. Continue the routine for 3-4 days to see positive effects. Plain water: When you cannot find vinegar, olive oil or hydrogen peroxide, you can simply use clean, warm water to loosen that stubborn ear wax. Be sure to leave water there in your ear for a few seconds before you drain it out. Homeopathic: To avoid the hassle of preparing a solution at home, you can go buy yourself some over-the-counter homeopathic eardrops. Similasan's Ear Wax Relief is probably the best choice because it works effectively even if you're dealing with chronic ear wax blockage. Ear wax removal kit: Yet another effective way to relieve ear wax blockage is to buy a removal kit. A number of brands are available today, including Macks ProRinse kit, Debrox Ear wax Removal Kit, Squip Kyrosol Kit, etc. These kits come with complete instructions on how to use them, so you can flush ear wax easily even if you're no expert at it. Watch the following video to learn more about removing ear wax safely and effectively with professional advice. Home remedies may prove effective, but should be used only after you're sure that ear wax is the real culprit. However, if you know you have an ear wax blockage and conventional remedies aren't working, it's time to seek medical help. In fact, you should go to the hospital immediately if you experience a severe spinning sensation and find it difficult to walk. Patients with persistent vomiting and sudden loss of hearing should seek immediate medical help. Always run water into your ear when taking a bath, as this keeps your ear moist and prevents blockage. People who are prone to ear wax blockage should consider irrigating ears regularly. To avoid obstruction, under no circumstances should you be sticking anything like cotton swabs in your ear. Moreover, you should avoid using a strong jet or cold water to eliminate ear wax because it can even damage your eardrums and cause dizziness. At last, you can try to limit the consumption of dairy products and include foods containing omega-3 fatty acids to alleviate the problem of ear wax.